Acquisition is Easy. Retention is Hard. Acquiring new customers used to be really hard in SaaS. Most companies were limited to either banner ads via Google AdWords, or SEO. Today, getting tons of new users isn’t hard. What’s hard is keeping them. 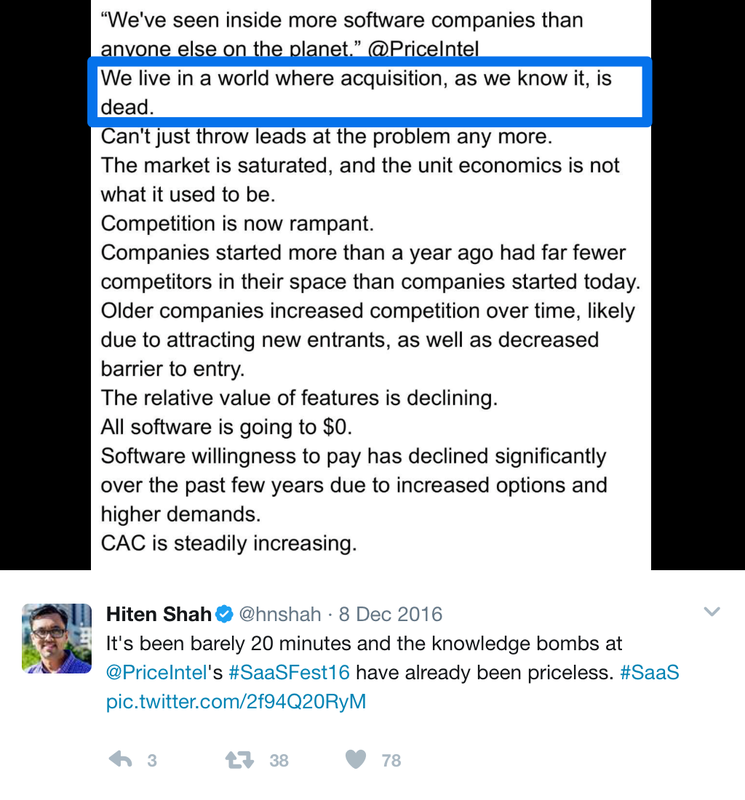 In December, I tweeted out some of the hardest-hitting points from Price Intelligently’s SaaSFest 2016. There’s one that stands out to me because it goes against some commonly held beliefs about SaaS growth: We live in a world where acquisition, as we know it, is dead. If you want to build something really great, you have to go beyond the low-hanging fruit. These days, getting lots of users to sign up for your product isn’t enough to sustain and scale a business. Brian Balfour, CEO of Reforge and former VP of Growth at HubSpot, has said that retention “is literally the foundation to all of growth.” But a lot of companies aren’t acting that way. A study by Price Intelligently shows that most SaaS companies are talking about and building products for acquisition instead of retention. 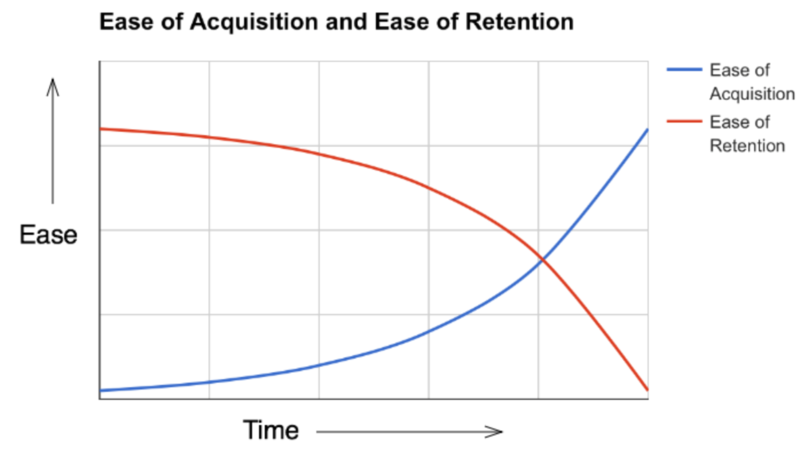 If retention is so important, why are people still so obsessed with and focused on acquisition? The increased knowledge sharing, better technology, and lowered cost of tools in SaaS has made acquisition easier. But the easier it gets for your company to acquire customers, the harder it gets to retain them. Increased competition: Removed barriers of entry have made it easier for an entrepreneur to enter the ring with their product. More people are building and selling SaaS, so you have to provide more than “just” a product to stand out to your target market. Lower switching costs between SaaS tools: Freemium tools provide a risk-free way for potential customers to try your product. But the easier it is for potential customers to switch to you from another product, the easier it is for your customers to leave your product for competitors’ products. Cheaper distribution: Gone are the days of servers on racks in Orange County. The cost of product distribution in SaaS is going to zero. Even though it’s easier for you to serve more customers, not all of them are customers that you can build a business around. We are in the second wave of SaaS, where the industry is more competitive than ever. The winner used to be the company with the biggest sales team. In today’s zero-sum market, you win or lose based on the strength of your product. You’ll keep customers with a product that holds attention, delivers more and more value over time, and aligns with what your best customers want. 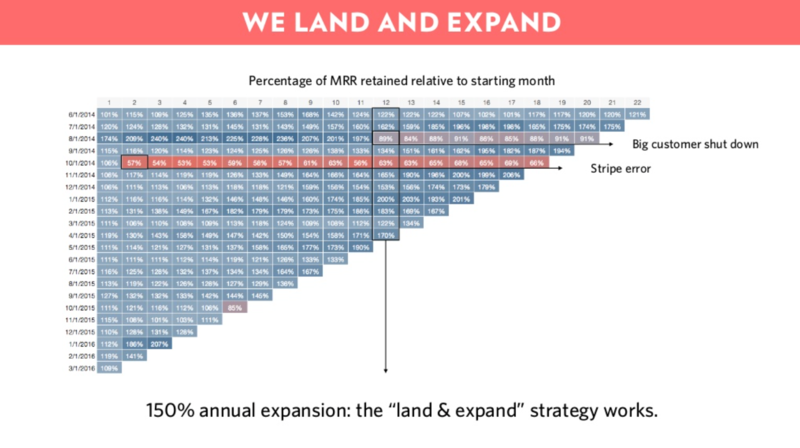 Each shift in SaaS that made acquisition easier has made retention more difficult. Here’s how to overcome each of those challenges. Information about building SaaS companies is available for free. As more people gain experience in the industry, more people are willing to share their experiences to help others learn. More tools for building SaaS are available to developers at a low cost. Open-source software tools like Twilio and Clearbit help companies build apps and find customers. The rise of Amazon Web Services has also made it easier and cheaper to build and scale apps. End-users have the mentality that “there is an app for everything.” As more SaaS products emerge and become increasingly integrated into workflows, the old ways of doing things are replaced with SaaS. The market is more receptive to SaaS solutions and there’s more money to be made in the industry: from 2006 to 2016, revenue generated by software companies tripled from $53B to $169B. It’s a double-edged sword. The ease of entry has helped over 150,000 unique corporate cloud app toss their hats into the ring. More competition from apps competing in the same space makes customers’ finite attention a scarce resource. When competition is high, your best weapon for retention is a great product that customers genuinely want to use. One way to do this is to be useful to your customers in several ways. For example, a company like Intercom is aiming to be a one-stop-shop for all of a user’s customer communication needs. Over time, being the best solution for their customers has evolved from providing one tool to providing a suite of tools. Companies are trending towards all-in-one-SaaS. Intercom started as a simple chat-style pop-up that was based on the idea that talking to your customers should be easy. But today, customer communication means more than just live chat. It’s live chat, email, a knowledge base, and more—all consolidated into one system. Intercom accordingly has expanded into a suite of products with live chat, in-app messaging, a customer help desk, and the public knowledge base product Educate. They all work together on the Intercom platform. Intercom’s new pricing shows that they’re still trying to figure out how to get everyone on to their platform, instead of just using one or two products. The platform is free, and all users can try any of the products with a free trial. The push is to have the customer engage with the whole service, rather than just pieces. Where is the industry going? How is new technology affecting the industry? What additional products would help my customers right now? What are my customers going to want in 1 year, 5 years, 10 years? Intercom is looking for ways to stay relevant to their customers as competition ramps up and customers’ scarce attention is pulled in several directions. Diversifying and expanding your product offerings can save you from becoming obsolete in the midst of other options. There aren’t just more competitors in SaaS. It’s also easier than ever for competitors to acquire your current customers. Subscription models give customers an opportunity to churn. Periodic payments instead of a large initial investment mean it’s easy for customers to switch providers at any time without losing money or breaking a contract. Freemium SaaS lets users try competing products risk-free. Companies adopt freemium models as a low-friction way to acquire customers and show them the value of their product. Customers of one product can then “sample and switch” to a competitor and feel confident that they know what they’re getting. Data stored in products no longer locks customers in. Customers used to be more likely to stay with a certain product the longer they used it because the product stored more and more of their data. But tools like Segment make it easy for customers to extract their data from one product and bring it to a competitor. A SaaS customer can come and go whenever they please. When customers know that opportunity cost is low, they’re more inclined to give your product a try. That’s great—but once they’ve signed up, they might also be inclined to try out your competitor. Today, the financial costs and opportunity costs of switching SaaS tools are low. The things that may have made customers stay in the past—obstacles to switching—aren’t as relevant anymore. But if you’re delivering on what your most high-value customers want, and giving them more and more of that value over time, customers have no reason to switch to competitors. This is how Front has grown in a competitive space. Instead of focusing on sheer growth by logos, Front focuses on growing by retaining and up-selling current users. CEO Mathilde Collin recently published the deck they used to raise a $10M series A, which shows how growing existing accounts locked in the company’s success. Front created a product that was seriously sticky for many of its users. Front users grew their usage rapidly (50% of Front’s monthly active users were also daily active users). At the same time, Front up-sold these customers to higher plans—and expanded revenue as a result. Front tapped into what customers really loved about the app and what increased their engagement. The ability to assign and share emails, the team-wide transparency, and the built-in collaborative tools all encouraged more use by more people throughout teams. Front grew existing accounts by 50% on average and achieved net negative churn. Their retention was so high, they could grow month-to-month without acquisitions. Understanding what customers want comes from communication with their customers. Who are the ideal users of your product? What is the most useful aspect of your product for these users? How can you improve this feature or make it more visible? How can you grow with your users as their companies grow? From day 1, Front tries to get their users to add more team members, use more features, and send more emails. Customer retention is woven right into their acquisition and onboarding. Since every customer is a flight risk, Front plans to upsell them from the day they sign up. The marginal cost of SaaS products is nearly zero. All products have an initial cost and a marginal cost. The initial cost is what it takes to service the first customer. The marginal cost is what it takes to service every customer after that. AWS has made it possible for companies to distribute software for next to nothing. More tools to market and sell products are available. The rise in the number of SaaS tools has helped make sales, marketing, and growth much more efficient. Companies today can achieve wide marketing distribution, even with a small team. Companies are moving upmarket to sell to the enterprise. SaaS companies that get their start in the SMB market may grow by moving upmarket and selling to the enterprise, like New Relic. They improve their product over time to create a tool that can meet the needs of larger companies. This “bottoms-up” strategy helps them sell software to the enterprise with a much more efficient sales cycle. It now costs less to market to more people and to serve more customers. The challenge is building a business off the backs of those customers. The added challenge is retaining customers who came in via cheap and aggressive acquisition campaigns but were never fully sold on your product in the first place. Cheap distribution makes it easy to fill the top of your funnel. But to acquire customers who are really interested in sticking with your company, you have to make sure your product and marketing are aligned. We built Crazy Egg in a space where Google Analytics already existed. But even though Google Analytics was free and helping a lot of people, it wasn’t doing some key things that developers needed. So our first step in building Crazy Egg was to put up an early access landing page and start talking to potential customers. Today, without the servers on racks in Orange County, it’s easier than ever to pull in as many customers as possible. But Crazy Egg’s growth was driven by customers who were attracted to the product’s specific value—the heat map—and stuck around to use it. What feature attracts customers to the product? Which ones do they find most useful after they’ve signed up? How do you qualify your leads to determine which potential customers are worth pursuing? Just because it’s easy to market to and serve more customers doesn’t mean you should. If you’re chasing leads instead of telling people about the product’s value, you’re wasting time and money on customers who are going to churn. As acquisition gets easier and retention gets harder, it’s not enough to create a tool. You have to create the best solution option for your customers. That’s why all of these macro issues converge on one idea: improving your own product. The current SaaS landscape has made acquisition a no-brainer. But the solution to a more competitive environment isn’t to use these readily-available acquisition strategies. When it comes to growth, these hyper-visible strategies are dead. How does your product fit within your industry? How will it fit in the coming years? In what ways does your product encourage usage? How can you make these features more accessible to users? What do the customers who stay the longest like the best? How can you align your marketing around these features? Growth has to be a combination of smart acquisition and smart retention. Understand what’s easy, execute it well, and then reach further and deliver on the challenges.